My first experience with the Italian language was in utero and I suspect I overheard a conversation between my mother and grandmother in relation to food (something along the the lines, “cosa stai facendo per la cena?” or what are you making for dinner?). Post birth, I didn’t aquire English until I was five or so; legend has it that my mother dropped me off at kindergarten class in 1981 and the teacher asked if I just flew in from Milan given my brown leather boots, Merino wool short sleeved turtle neck, deep tan, and inability to speak the English language? My kindergarten teacher, Mrs. Biggio, argued that I should work on my English at home and register for school the following year. Of course, my mother refused and told, not suggested, Mrs. Biggio I was ready for school and that I would pick up English quickly. Needless to say, I was speaking full blown English by the time Christmas arrived and I may have even been permitted to wear a pair of white sneakers to class on occasion (I’ll save my snack time story for another post). My mother was right to suggest to Mrs Biggio that I start school even though my primary language was not English given how our brains our structured for language acquisition. That is to say, most linguists agree that the time period from birth to just prior to puberty is a golden period in terms of language acquisition and that the “language acquisition device” — a mechanism which enables an individual to recreate correctly the rules (grammar) and certain other characteristics of language used by speakers around the learner is strongest during the aforementioned time period. 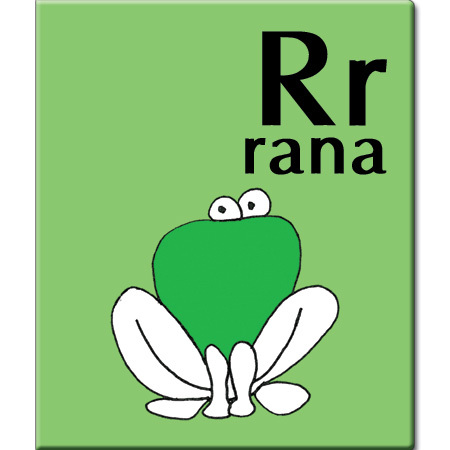 I was fortunate to be raised in two language communities (one that spoke Italian <viz., my family> and another that spoke English <viz., school, community, etc>) so the second language acquisition thing came easily. However, what if you’re immediate family does not speak a second language and you’re only exposed to English? The best strategy for learning Italian as a second language is to start young and to expose the child to an Italian speaking community as often as possible. A well stocked Italian children’s book library wouldn’t hurt, as well. 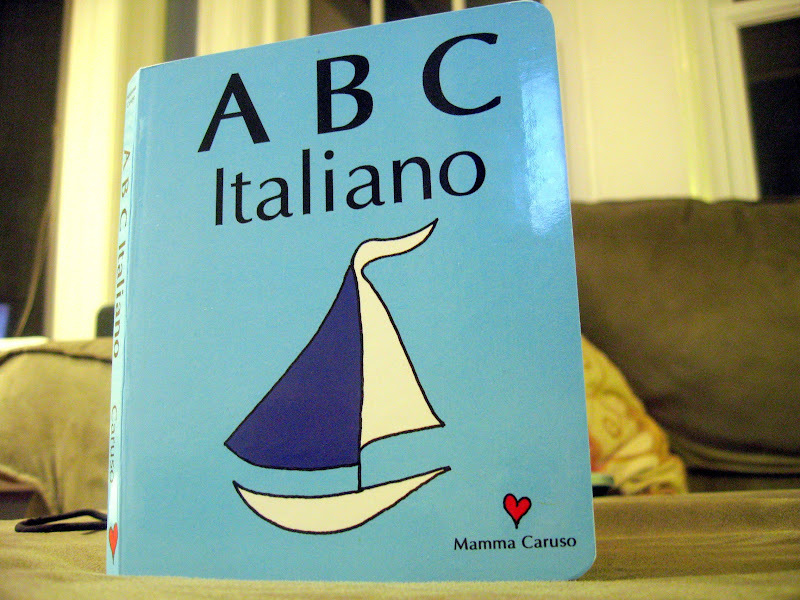 ABC Italiano is one such children’s book I highly recommend. The book, written and illustrated by Sonya Caruso, is a simple and wonderful introduction to Italian for your toddler. 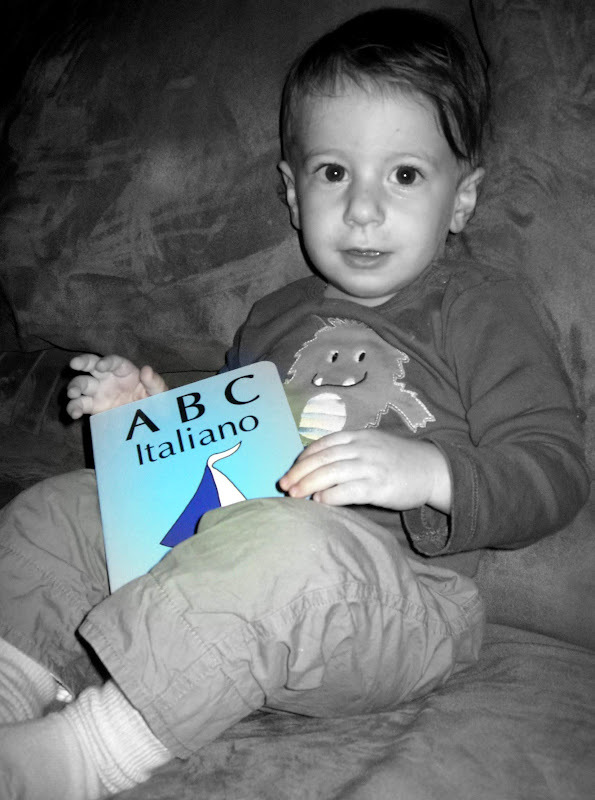 We “tested” ABC Italiano on our 16 month old son and he thoroughly enjoyed the minimalist illustrations and selected words for each letter of the Italian alphabet. As my elementary education teacher wife suggested, the book is perfect for a young Italian language learner and both the word set the author selected along with the colorful and simple illustrations make for a great introduction to the Italian language. – What you need to do to enter: 1. leave a comment under this post on why preserving the Italian language is important to you and 2. “Like” the Scordo.com Facebook Fan page and the Italian Baby Books page. If you’re a fan of Scordo on Facebook already then you’ll need to click on “suggest to friends” link underneath the Scordo logo on our Facebook Fan page and spread the word to all of your friends! – The contest is open until 12 midnight on 12/20 and two random user will be picked via Random.org (sorry contest only open to folks from the US given shipping logistics). The winner will be announced immediately on Twitter (so please follow me) and on Scordo.com by 5PM on Monday, 12/21. – Mamma Caruso will send out the book during the week of 12/27. Good luck and thanks for keeping the Italian language alive and well in the United States! I was lucky to grow up in an environment in which both English and Italian (albeit the Neapolitan dialect) were spoken. I was even luckier to attend a language academy in elementary school and study Italian to learn it the “right” way. Unfortunately, my almost-two-year-old daughter, Lucia, isn’t being raised in the same environment, but I’m doing my best to speak Italian to her as often as possible. Lucia already has a few Italian language learning books and CDs, and ABC Italiano would be the perfect addition to her collection! Ciao! Such an adorable book for little ones. This would be a great book for when I eventually have kids. I liked your page & Italian Baby Books on Facebook & suggested the page to my friends. I think preserving the Italian language is important to me because when you preserve a language, you are preserving the culture as well. As an Italian I want to preserve our language so the next generation can learn it as well. If you don’t preserve your language your cultural heritage fades away. A language is a big part of the communication of our culture & where we come from. I can so relate- I too grew up in a 2 language house! Three languages buzz around my house these days…English,Italian (Sicilian) and Spanish…my son understands a lot but doesn’t speak the 3….makes me sad. He needs to study Italian…its a must! You of course are my facebook friend and so is the Italian Childrens Book! Great stocking stuffer for my son…gotta have this book! oh! we would love this book for our granddaughters.